WHAT DOES 55 YEARS IN BUSINESS MEAN TO YOU? THE RIGHT New & Used Hospital Bed Buy, Sell, Rental, Trade & Finance FOR YOU! PRICE, QUALITY, GUARANTEE & SERVICE. YOU WILL BE GLAD YOU DID! "SO YOU WANT A HOSPITAL BED . . . . .?" How much are hospital bed Rentals? On average, about $250.00 a month (semi-electric) and $300 a month for fully electric high-low Rental, plus $75.00 pick up and $75.00 delivery. Price includes hospital bed, mattress and side rails. Weekly charge is $125.00 for semi-electric and $150 for fully electric: hospital bed Rental los angeles, phoenix, and orange county. What are the choices in hospital beds? Patriot by Graham Field Lumex* (*our favorite). How much do hospital beds cost to buy? The Cost of a 2-motor semi-electric hospital bed is $1599.00; and the cost of a fully electric 3-motor high low hospital bed is $1899.00. Price includes mattress and side rails (choice of half rails and full rails). How much are Used Hospital Beds? Used Hospital Beds are 1/2 OFF the Regular Price. Semi-Electric Reg. $1599 New, Used $799; Fully Electric Reg. $1899 New, Used $949. Do hospital beds come in different sizes? Hospital Bed Dimensions: Standard size Hospital Beds have a sleep surface of 36"W x 80"L. For those over 6/1" some Hospital Beds come in the 84" Length. Some manufacturers make oversize (Bariatric Extra Wide) Hospital Beds at 42", 48", 53"(full, regular, double) and 60" width (queen). You can also put two beds together and make a Dual King. What mattress works best on a hospital bed? The standard Hospital Bed comes with a thick vinyl innersping or foam mattress. You can upgrade to a soft, thin vinyl; pocketed coil, memory foam, latex foam and low air loss mattress. What are other names for hospital beds? You can use many terms to describe a hospital bed: hi-lo motorized, power, high low, fully electric 3-motor, semi-electric 2-motor, powered hi-low, medical, recliner lift bed . . . and more! What is bariatric hospital bed? A bariatric bed is specifically designed with a heavy-duty, extra wide bed frame. There are a few different styles of bariatric hospital beds for quality home care. ... A full electric bariatric bed is controlled completely by a remote, making it easy for patients to raise and lower the bed as needed. Are Used Bariatric Beds Available for 1/2 OFF the Regular Price? What is a semi electric hospital bed? What is the standard height of a hospital bed? The average bed height today is about 25 inches. At this height, your feet can reach the floor when you're seated on the edge of the mattress. Built 36 inches off the floor, an antique bed is quite high, while a modern platform bed is typically only about 18 inches high. A 3-motor Hospital Bed can usually go from a range of 18" with the mattress and 32" high with the mattress. Why do people buy the full electric 3-motor hospital bed? To help the patient get in and out of bed, to help the nurse and caregiver from leaning over too much, to help the patient transfer to a wheelchair or walker. What is a LOW Hospital Bed? Some hospital beds go under 10" to the ground to make the bed safe in case someone should fall out of the bed. What is Trendellenburg and Reverse Trendellenburg? A little like a teeter-totter: The bed can independent rise in the legs or the heads. Many positions offer a lot more health and comfort benefits that just the standard 3-motor fully electric hospital bed. Very helpful to people who are actually confined to a bed, or disabled. What is a Low Air Loss Mattress or Specialty Mattress Selection? There is a whole industry for people with major issues of disability and bed sores and special comfort needs. 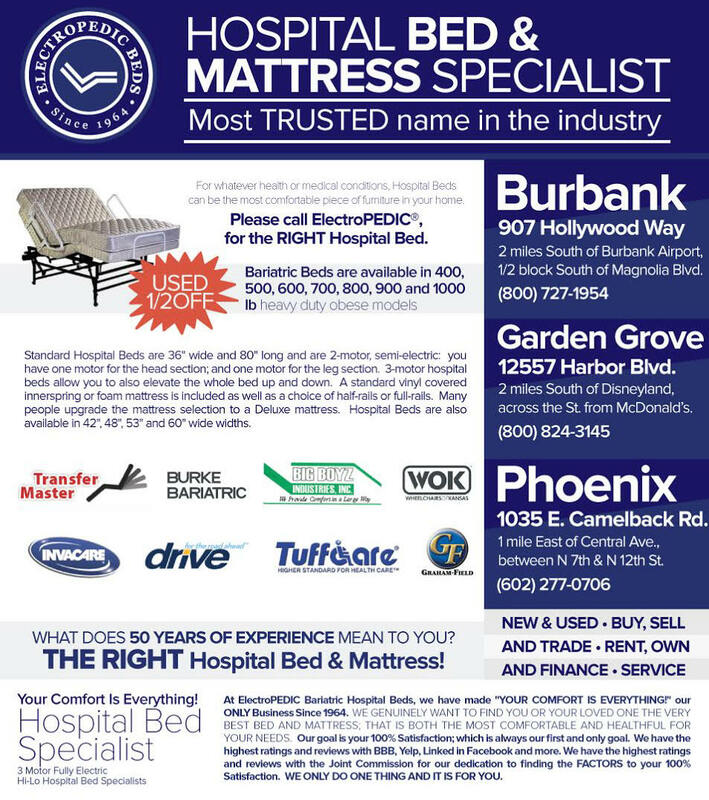 Some of the Hospital Bed Mattress manufacturers are: Span America, Blue Chip, Volkner and Latexpedic. It is very easy to upgrade to a pocketed coil innerspring mattress or a memory foam mattress. Our favorite Latex Mattresses are the 7" Latex Mattress, 9" High Profile and 11" THE ULTIMATE. We also have the 100% Natural and Organic Whole Mattress. What is the purpose of side-rails? You get your choice of Half-Rails or Full-Rails. The rails are adjustable to 3 positions, including down. Side-Rails assist the patient to move around in the bed, and especially to get out of the bed. Full Rails act to help keep the patient in the bed and not falling out of the bed. Is Bedding available for hospital beds? We have bottom fitted sheets, standard mattress pads and deluxe waterproof mattress pads and specialty electric bed pillows are available. What is the difference between an Adjustable Bed and a Hospital Bed? A standard hospital bed is 36" x 80" long, and a standard adjustable bed is 2" wider: 38" x 80". Adjustable Beds and Hospital Beds both have two motors standard: one for the back and one for the legs. 3-Motor Hospital Beds and Adjustable Beds are available that also allow the whole bed to go up and down. Adjustable Beds come in ALL SIZES and LENGTHS and look better than a Hospital Bed. Today, most Adjustable Beds have over a 600 lb. weight capacity standard. Do some people prefer to sleep on a power lift chair 'n recliner? Some people actually prefer to sleep in a 2-motor independent head and foot recliner recliner. Video. We have many models on display in our showrooms.